This eBook is a list of the tribes of Africa sorted by country and by tribe name. You may see what appears to be the same tribe listed several times. Many African tribes have several spellings for their name. For example, the Chokwe tribe has over thirty spellings. Also, many tribes live in more than one country. When the country boundaries where drawn up no one paid attention to where tribal lands and boundaries began and ended. Some tribes were split up when Africa was divided into political countries; other tribes have migrated during times of famine and/or violence. Although these lists are not yet complete, they are the most complete set of lists you will find anywhere on the internet. Once you purchase this eBook you can download it at any time and all updates are free. This list of African tribes will be updated regularly. 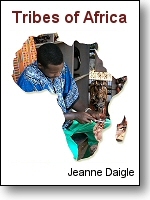 Sign up for the African Culture newsletter to find out when the next edition of this eBook is made available. Second edition November 2008 - 34 pages.